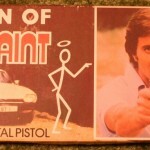 Leslie Charteris hero the saint was to return to television screens in the mid 1970’s, but no longer was Roger Moore at the helm, as the debonair hero, the role instead was now taken by Ian Ogilvy. 24 episodes of Return of the Saint were produced, the show being broadcast on ITV over the winter period of 1978 -79. It had been coproduced by ITC and the Italian broadcaster RAI, and unlike its predecessor, which had been almost entirely filmed in the UK, despite being set around the world, this series featured extensive location shooting around Europe. The adventures in this series were also different, in that they were original teleplays not based on any Charteris stories, though several would be adapted as books, giving Charteris the writing credit. Look In 1978 No 44 Return of the Saint cover. 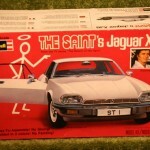 Return of the Saint The Saints Jaguar XJS large diecast.